josh cochrane is an illustrator, based out of los angeles, that i stumbled upon a couple weeks ago. 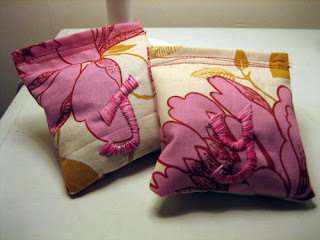 his work is detailed but seems really clean & easy to grasp. his work ranges from editorial to advertisements; his clients include the new york times & hornall anderson (seattle based marketing & design firm). the thing i enjoy most about cochrane's website is his blog. he takes the time to walk through the thought process or tell a story explaining each project he is working on. the voice in his writing is as if he were a friend giving you a tour through his home office. i'd like to buy the above print, but i'm not quite sure where i would put it. maybe in my hallway with a hook below for my umbrellas. 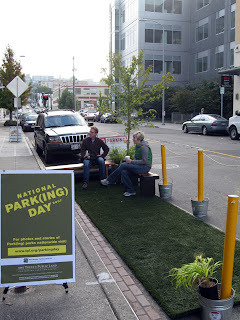 my firm created a park(ing) space in south lake union. the event was done in coordination with rebar & the trust for public land, a part of park(ing) day 2007.
i sent in some photos of my window & dining area of my place to apartment therapy for suggestions. i got some good advice from the people of at san francisco & readers; it looks like i may have some work to do. 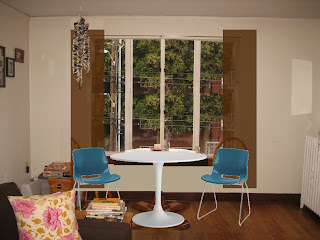 i'm not quite sure i want to paint, but have been thinking about replacing my dining set for a while. don't i have anything better to do? i haven't bought kanye's newest cd yet, because i've been slightly annoyed with the 50 cent hype & have also been disappointed by stronger, the young folks remix & can't tell me nothin'. but this song & video featuring t-pain is soooo tight. he's back on my good side, i might have to buy the album tonight. i'd like to addthe kanye track, homecoming ft chris martin to my playlist. thanks casey, "fireworks over lake michigan." i've been meaning to get something to display pictures & prints above my desk. while at home depot i decided to pick up some 8" by 5" galvanized steal panels to complete the task. i simply used mounting tape to attached the panels to my wall & it seems to be sturdy enough to hold my stuff. 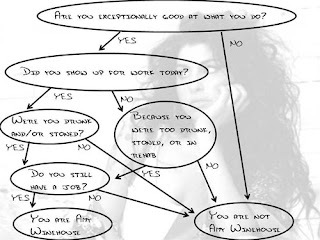 seems that pointless flowcharts are all the rage. i find the one above particularly funny, seeing that she cancelled the show i had tickets too. booo.